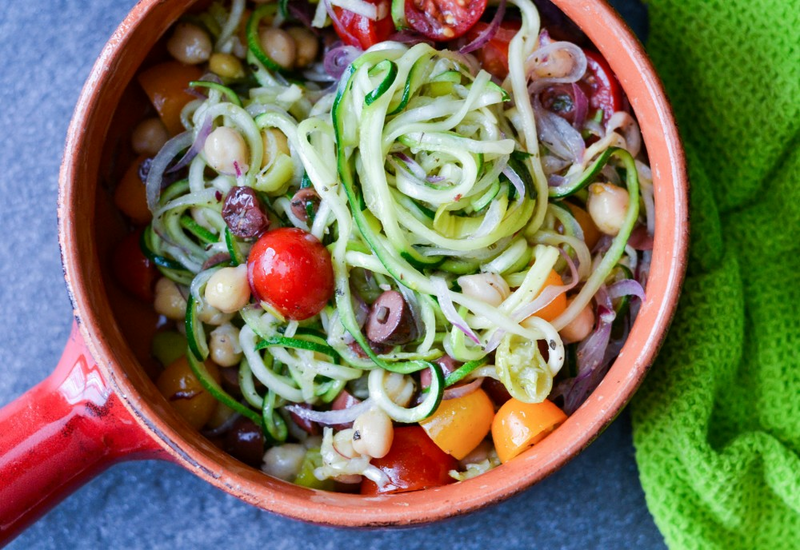 If you like pasta salad, you'll especially love this flavorful Greek salad made with spiralized zucchini noodles, pepperoncini, olives, and chickpeas. Tossed in a homemade dressing, this salad is bursting with authentic Mediterranean flavors. Try green olives instead of Kalamata olives. Per Serving: 155 calories; 10g fat; 11.9g carbohydrates; 5g protein; 11mg cholesterol; 585mg sodium. I made this salad in under 20 minutes and brought it to my office party. Everyone thought I ordered it from a Greek restaurant! It was so good, I even scored some points with the boss! I almost didn't add the pepperoncini, but I'm glad I did, as it really gave it that extra wow factor flavor! One of my favorite salads! So good! I served it in a large ceramic salad bowl and my guests ate it up! I skipped salting the zucchini before hand, I didn't think it was absolutely necessary. The recipe turned out great! What I loved most is the Greek dressing. It still felt like a real pasta salad dish, and the Mediterranean flavors were authentic. I also really loved the pepperoncini and feta cheese. All around great recipe and perfect for lunch. Very flavorful. Great salad. I've made it twice, once with zoodles and the second time with actual pasta (tri-color to be exact). I had to use extra olive oil and red wine vinegar when using noodles because it was a little dry. The zucchini noodles naturally hold water so they the amount of vinegar and oil this recipe calls for was perfect. This is the first recipe I made using my new spiralizer. I doubled the recipe and used 1 zucchini and 1 cucumber. The spiralizer was a gift from my mom, I get so much use out of it!